There is a saying that ‘what gets measured, gets done.’ Do you find that rings true in Rotary? You can measure a year: 525,625 minutes. 8,760 hours. A number of meetings held and club events hosted. You can count the number of trees your club planted, and how many Youth you supported though RYLA, Youth Exchange, scholarships, Students of the Month. You can even calculate the number of hours your club members have volunteered! District Grant Final Report Due April 30, 2018! If your club had a District Grant in 2017-18, please complete the Final Report Form found on the District 5495 website under Foundation/District Grants. Upload this form along with all receipts to the project website: www.matchinggrants.org. 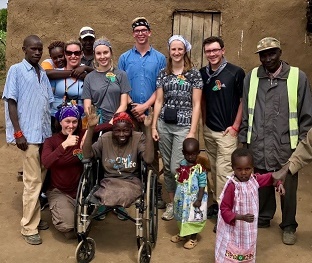 The identities of the five 2018 Interact Ambassadors to Kenya were dramatically revealed at the recent Interact District’s 5th Annual District Conference, held at Perry High School in Gilbert. 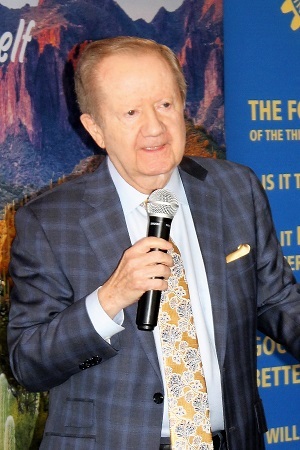 Al McCoy, often called the dean of NBA play-by-play announcers and the "Voice of the Phoenix Suns" for 46 years, spoke to the Rotary Club of Scottsdale members and guests at a luncheon meeting held at Scottsdale's McCormick Ranch Golf Club's Pavilion. When introducing McCoy, Rotarian Jim Bruner shared that both of he and Al McCoy grew up in Iowa farm country and were Des Moines Iowa Drake University alumni. 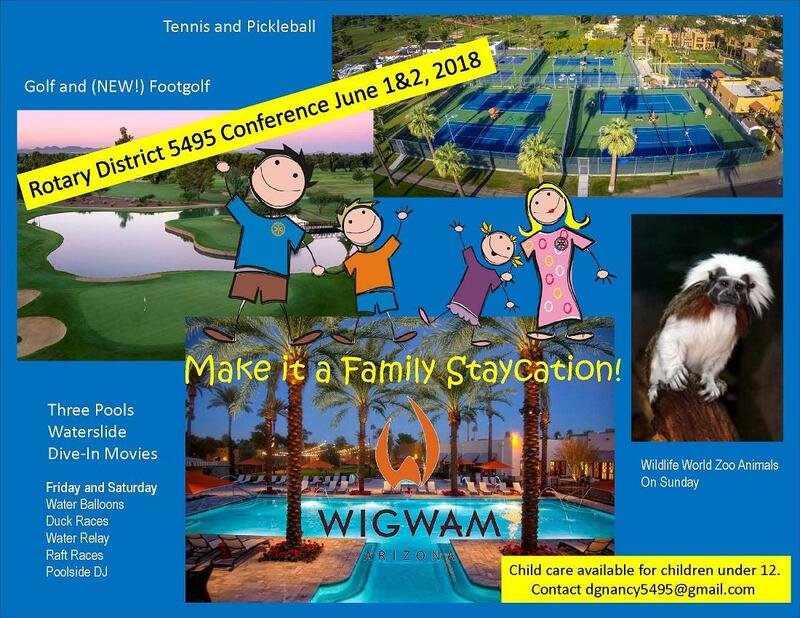 $125 per person includes golf, cart (for two), balls, dinner, drinks and silent auction. Membership in Rotary uses a classiﬁcation system based on vocations – and the process of membership development strives to help clubs create an image of its local business and professional world. This unique feature provides the source for Rotary’s commitment to vocational service, the second of Rotary’s Five Avenues of Service. 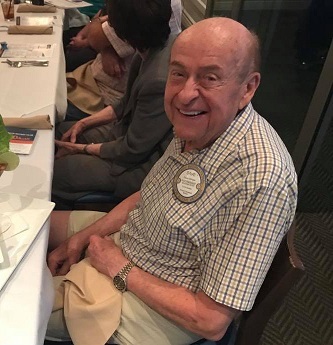 The Rotary eClub of the Southwest USA lost one of our cherished members last Monday, March 19, after a short stay in hospice care. Frances De Nuit was an educator who earned her MA at California State University-San Bernardino and her PhD at University of Southern California. 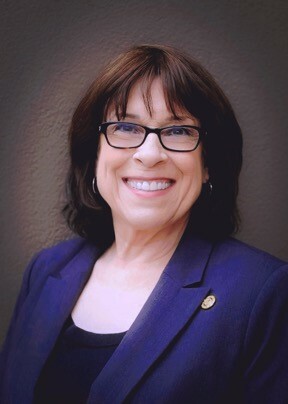 Prior to becoming Faculty Supervisor at the University of Phoenix in Albuquerque, NM in February 2015, Frances taught Language Arts at Española Valley High School in northern New Mexico. Frances became a Rotarian in September 1994 when she joined the Rotary Club of Indian Wells, California, US. While she relocated many times her career, Frances found a new Rotary home. In July 2010, she joined ReCSWUSA. As an educator, she shared her time, treasury, and talents in service with the Club. Aside from serving in multiple board roles, she opened her home for gatherings of local eClubbers. She was a consistent friend and mentor to her fellow members. Her compassion, intellect, positive attitude, and skilled listener will be missed. Please keep her family and friends in your thoughts and prayers. 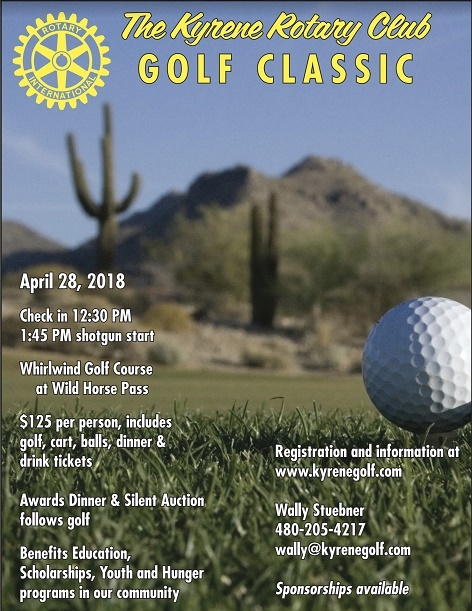 The Phoenix-Camelback Rotary Club is holding its annual Boots-N-Saddles event on April 7. In its 22nd year, it features dinner, live and silent auctions, as well as great company from some amazing people. The funds raised at this event go to support their main beneficiary, Feed Our Babies, USA, and their secondary recipient, the Cuernavaca, Mexico, Clean Drinking Water Rainwater Capture Project. This year, the Boots-N-Saddles event is extra special, as they honor their founder, Dr. Dave Utzinger, who passed away suddenly in January. Everyone who knew him, no matter how long, wanted to be like Dave. It was a beautiful afternoon at Salt River Fields at Talking Stick when 119 Rotary Club of Scottsdale members and guests gathered for their annual Spring Training game to watch the Colorado Rockies and the Chicago Cubs, with the Cubs winning 5 to 4. 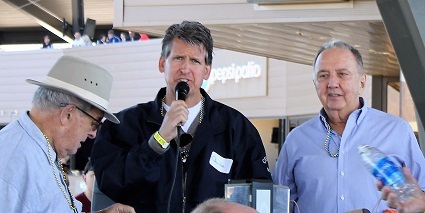 Rockies owner/chairman and CEO, Richard L. Monfort, was on hand to greet Rotarians and guests at the game. Monfort is spending his 21st year with the Rockies franchise, is a Colorado native, Rotarian and member of the Boulder Rotary Club. RYLA 5495 Ponderosa camp is almost here. 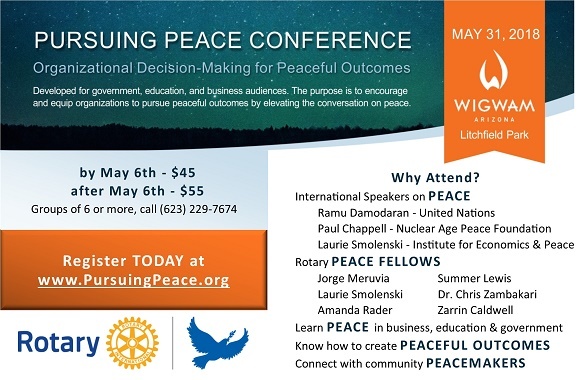 This is a life-changing experience for the students who attend. This year, RYLA 5495 Ponderosa will be conducting a brand new community service project; Kids Against Hunger. RYLA 5495 Pinerock has been participating in this for several years and, in January, packed approximately 45,000 meals. The Meal Packing Service Project each and every year has been one of the major highlights at RYLA 5495 Pinerock. We want ALL the students who attend RYLA 5495 programs to know the benefit of participating in Service Above Self. 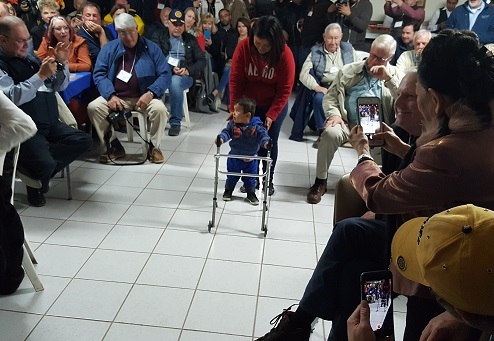 On a recent weekend in February, Rotarians from five states and six Rotary districts traveled by coach bus to Caborca, Sonora, Mexico, on what has become an annual humanitarian pilgrimage to assist the members of the “Club Rotario de Caborca” with the polio inoculation of children in the ejidos (villages) outside the city of Caborca. Half of the 50 Rotarians on this year’s trip were from Arizona Rotary Districts 5495 and 5500. Rotarians from California, Nevada, Louisiana and Alabama also joined us on our Friday to Sunday adventure. Great Sedona Chili Cook-Off is one of the hottest events of the year! The Rotary Club of Sedona is excited to announce its eight annual Great Sedona Chili Cook-off on Saturday, May 5 at Tlaquepaque Arts and Crafts Village. This is a part of the Tlaquepaque Arts and Crafts Village’s Cinco de Mayo Fiesta weekend. The Great Sedona Chili Cook-off runs from 11 a.m. to 5 p.m. Admission is $15 and children under twelve are free. Top chefs from area restaurants along with a number of community leaders are busy perfecting their special chili recipes, which can be sampled at festive booths in Tlaquepaque’s Calle de Independencia. 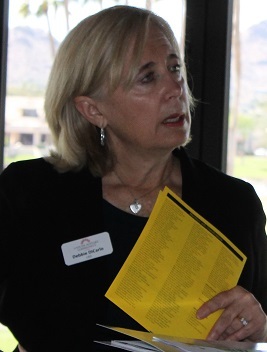 Rotary Club of Scottsdale members and guests were introduced to the Cancer Support Community Arizona (CSCAZ) recently. Since 1999, CSCAZ has served over 200,000 people. CSCAZ is part of a cancer support organization that has 170 locations worldwide. Its mission is to ensure that all people impacted by cancer are empowered by knowledge, strengthened by actions and sustained by community. CSCAZ provides comprehensive psychological and social services to people diagnosed with cancer and their loved ones in the state of Arizona. CSCAZ services are evidence-based and facilitated by licensed mental health professionals. Re: President Ian Riseley's 1.2 Million Tree Challenge: There's Still Time!! Earth Day, April 22, 2018, is fast approaching, which is also the “soft” closing date for President Ian Riseley’s Environmental Sustainability 1.2 Million Tree Challenge: “Plant a tree for every Rotarian”. Many Districts and their clubs have already engaged. Congratulations if your District’s clubs have already completed the Challenge. If not, there’s still time! Club Leadership Academy Returns April 21! Breakfast buffet opens at 8 a.m. Adjournment at 4:15 p.m. — right after the raffle. 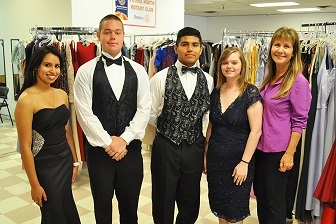 Beginning at the end of March and continuing through the second weekend in April, The Prom Closet—a project spearheaded by the Peoria North Rotary Club—will provide formal prom attire to boys and girls at absolutely no charge. 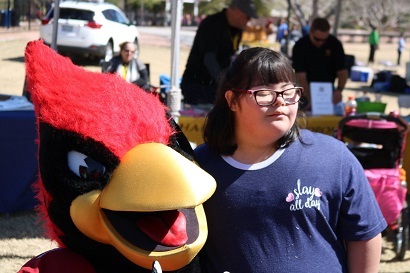 For 33 years, Scottsdale Sunrise has provided a great fun-filled day for special kids to just be themselves, along with their families. This year, it was held at McCormick Stillman Railroad Park on Saturday, February 24. As many of you know by now, our friend and long-time Rotarian, James R (Jim) Green, passed peacefully on Saturday, March 17, 2018 at the Banner Boswell Medical Center, Sun City. Jim had fought with a number of issues for the past few months and, sadly, they eventually got the best of him.